Midlite Construction Ltd. does more than just build powerlines. As soon as you identify a need for power, we can help. From design, to procurement, construction, and maintenance, we are a full-service, end-to-end EPC utility contractor. Moreover, we are experienced project managers and we maintain a team of schedulers, project engineers, cost controllers, quality controllers, EH&S advisors, and more. Our commitment to skillful project management and administration means you can be sure your critical infrastructure is in capable hands. We provide power – when you need it and how you need it. When our clients require a power solution for their entire operation, they’re looking for more than just a construction company. They’re looking for a capable service provider that can manage the entire process from start to finish. That’s why Midlite Construction Ltd. is proud to offer engineering, procurement, and construction services to a number of major energy companies. 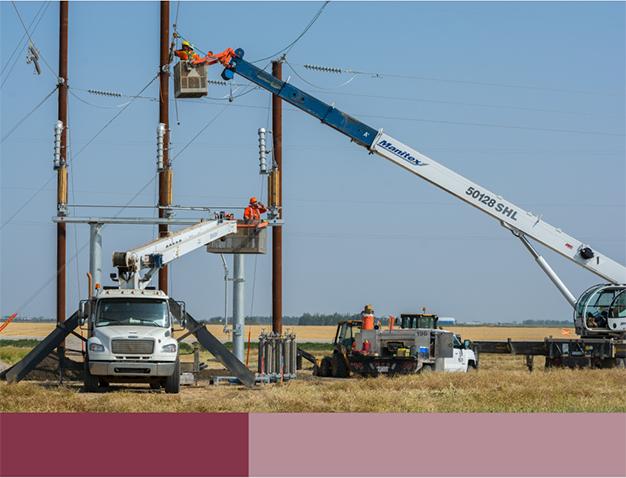 Midlite actively manages the engineering portion of your power project. Our relationships with Canada’s top high voltage engineering firms allow us to utilize the firm that best suits your unique project requirements, standards, and regulations. Since different firms have different capabilities and specialties, we ensure that you receive the right engineers for your project. When overseeing the engineering portion of your build, Midlite takes responsibility for communications with the firm and for managing design changes and conversations in a way that minimizes strain on your team. When electrical infrastructure projects are managed this way, – with Midlite managing engineering, procurement, and construction – clients can realize savings on overall electrical infrastructure costs when compared to managing engineering in-house. Many of our projects require large volumes of long-lead, specialty materials, tools, and supplies. 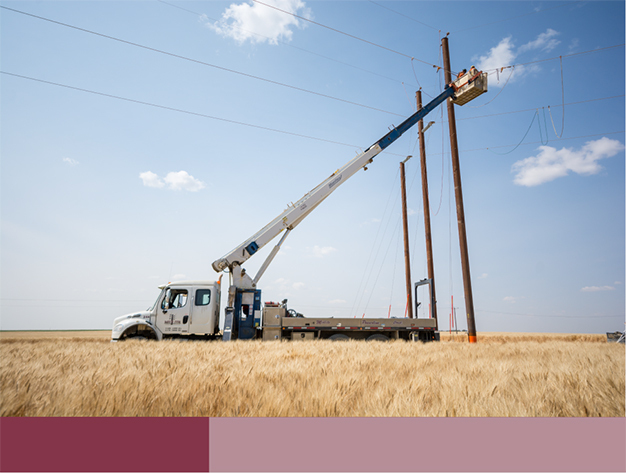 Our logistics and materials management team is capable of ordering, transporting, and storing items procured for powerline construction projects of virtually any size. Thanks to strong relationships we’ve built with domestic and international suppliers, we are able to receive preferred pricing and pass lower costs on to our clients. Thanks to our decades of experience, we’re always careful to identify long-lead items in early project discussions to avoid delays that can be difficult to foresee. Midlite is a highly capable construction company. It’s at the very core of our business and it’s how we got our start some 30 years ago. Your construction requirements are completely unique, so you require a contractor that is experienced, capable, and well-equipped. At Midlite, our construction crews are active at multiple project sites across Western Canada at any given time. 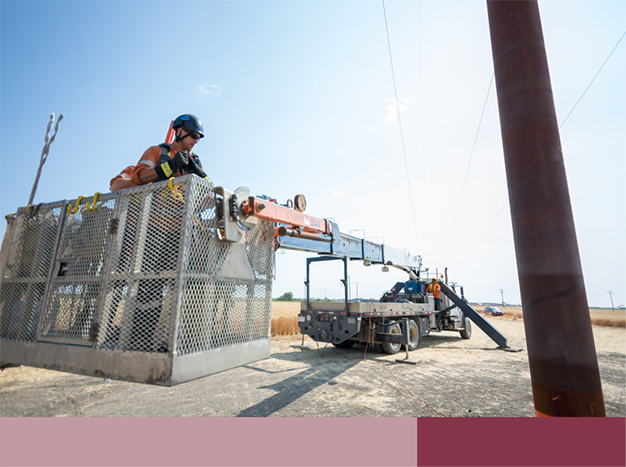 With dozens of powerline technicians and hundreds of pieces of specialized equipment, we’re able to organize and equip the crew that will work best for your unique construction requirements. 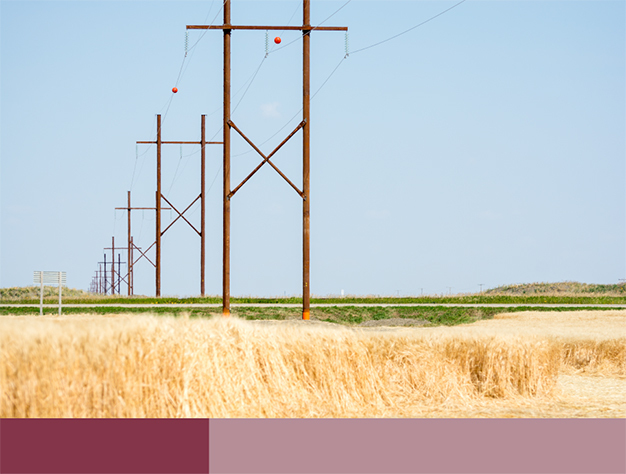 Transmission construction demands a highly capable utility contractor. It takes the right people, the right tools, and the right experience. 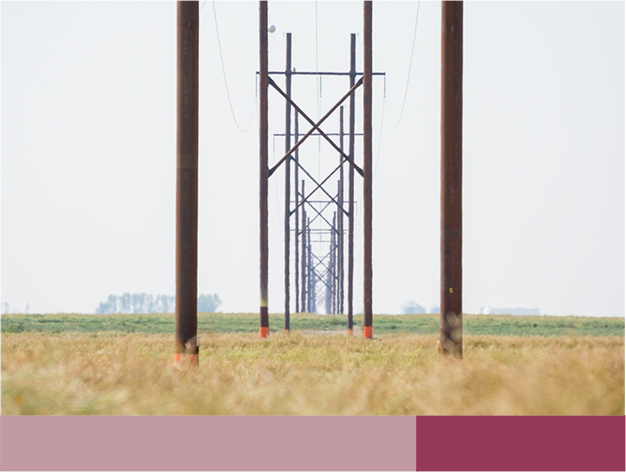 At Midlite, we are capable of constructing transmission lines from 72kV – 500kV. From road and river crossings, to some of northern Alberta’s most challenging terrain, Midlite knows transmission construction. Most recently, we have demonstrated our abilities across Western Canada, in the boreal forest and muskeg surrounding the oil sands and in the open prairies of Saskatchewan. 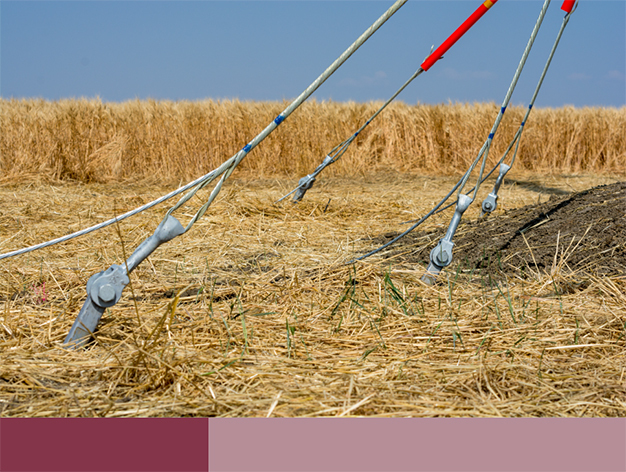 Underground installation presents a unique set of challenges that aren’t present in overhead installation. It requires specialized equipment, trained and experienced technicians, and fastidious document, permit, and process management. At Midlite, we possess the skills and experience to successfully complete underground installations in the most challenging work environments and have been doing so successfully for decades. 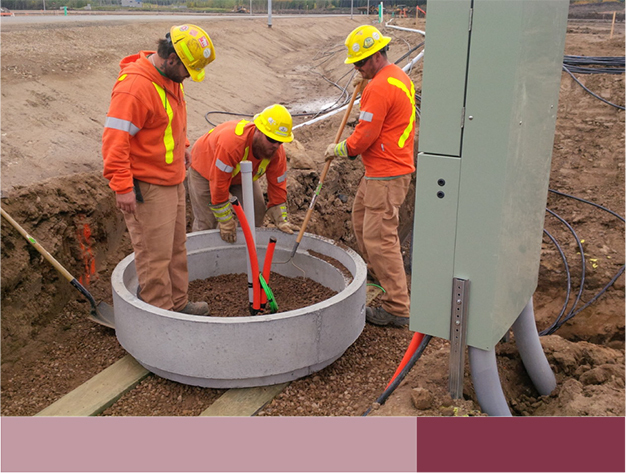 From ground disturbance to environmental impacts and subcontractor/ document management, Midlite has experience in dealing with the unique challenges that are routinely faced in underground installations. 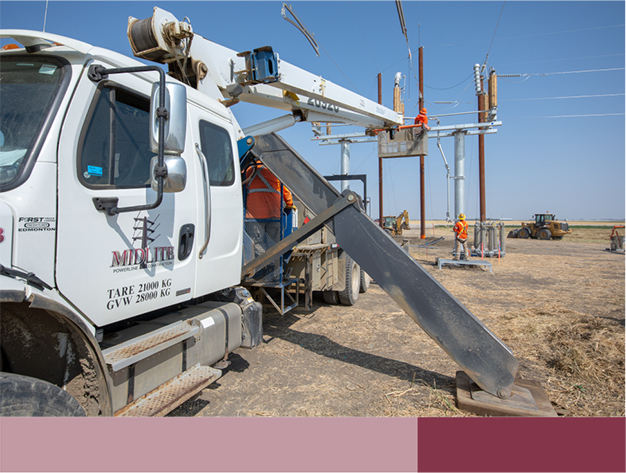 Midlite has been building and maintaining distribution powerlines since the company was founded in 1989. It is the very core of our business. While many utility contractors utilize medium-duty equipment and seasonal crews, Midlite has a large and capable fleet consisting of 50-ton cranes, specialized off-road equipment, and piling/pre-drilling capabilities, along with full-time crews working across Western Canada. Midlite installs above and below-ground distribution infrastructure from 12.5 kV to 72kV. We’ve held distribution maintenance contracts with some of the country’s largest energy companies for around 20 years and are consistently regarded as a top tier distribution service provider. Installing fibre optic cable presents a unique set of challenges. It isn’t something that a typical utility contractor can execute well. Performing this well requires specific procedures, processes, training, and equipment. This ensures that the final product is in good condition and is functioning as designed. Midlite has installed hundreds of kilometres of fibre optic cable for energy companies in Northern Alberta—where bitter cold presents one of the toughest installation environments. Our robust QA/QC process has ensured countless successful installs, while our utilization of 3rd party testing and terminations delivers confidence to our clients. 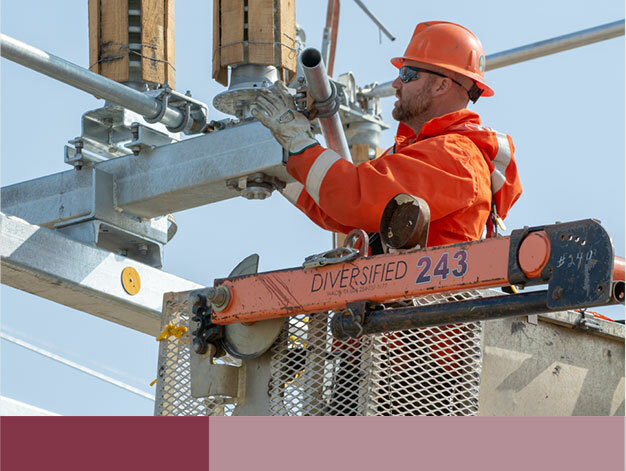 High Voltage Cable Termination, Splicing, and Testing is one of the most critical tasks in any successful powerline construction scope of work. Done right, it requires a high quality of workmanship and training, rigorous processes, extensive quality control, and detailed documentation. Due to the critical nature of these tasks, they should not be overlooked. Midlite has been successfully terminating, splicing, and testing high voltage cable since the very beginning. Today, we have a small group of designated individuals who have the training, experience, and equipment necessary to execute these critical tasks. Due to our maintenance contracts with some of Canada’s largest energy companies, many members of this small group are performing terminations, splices, and tests daily, meaning that they are operating with the highest level of technical expertise.